Download "Telecommunications Systems Manager I (Supervisor) Essential Task Rating Results"
2 Apply progressive discipline in accordance with departmental polices, laws, and/or statutes when necessary to ensure appropriate action is taken. Perform oversight and risk analysis of projects and deadlines to ensure delivery of services meet operational, scheduling, and budgetary requirements. Review and approve employee leave usage and requests to ensure appropriate staffing levels are maintained. Review and approve work authorization documents (e.g., TD-207, TD-280, TD- 284) which include the agency billing code, location for job required, and project specifics to initiate telecommunications project work. 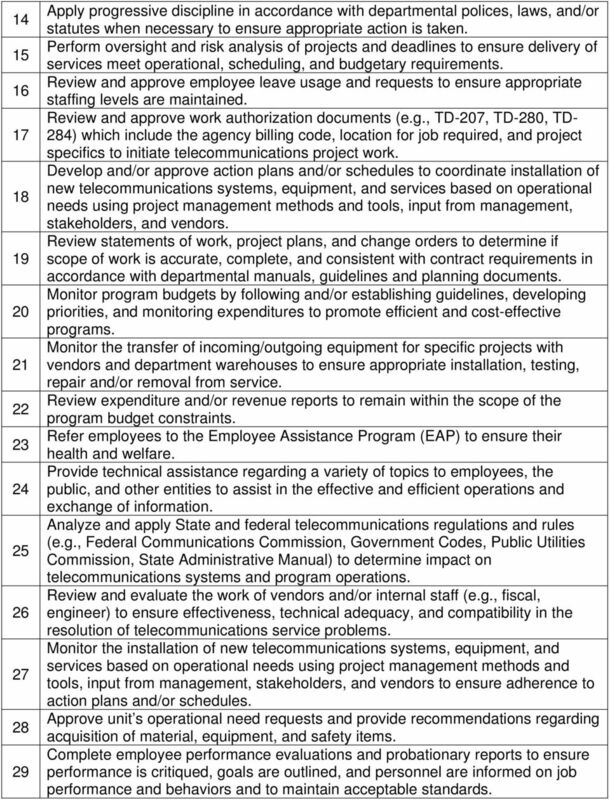 Develop and/or approve action plans and/or schedules to coordinate installation of new telecommunications systems, equipment, and services based on operational needs using project management methods and tools, input from management, stakeholders, and vendors. Review statements of work, project plans, and change orders to determine if scope of work is accurate, complete, and consistent with contract requirements in accordance with departmental manuals, guidelines and planning documents. Monitor program budgets by following and/or establishing guidelines, developing Monitor the transfer of incoming/outgoing equipment for specific projects with vendors and department warehouses to ensure appropriate installation, testing, repair and/or removal from service. Review expenditure and/or revenue reports to remain within the scope of the program budget constraints. Refer employees to the Employee Assistance Program (EAP) to ensure their health and welfare. Provide technical assistance regarding a variety of topics to employees, the public, and other entities to assist in the effective and efficient operations and exchange of information. Analyze and apply State and federal telecommunications regulations and rules (e.g., Federal Communications Commission, Government Codes, Public Utilities Commission, State Administrative Manual) to determine impact on telecommunications systems and program operations. 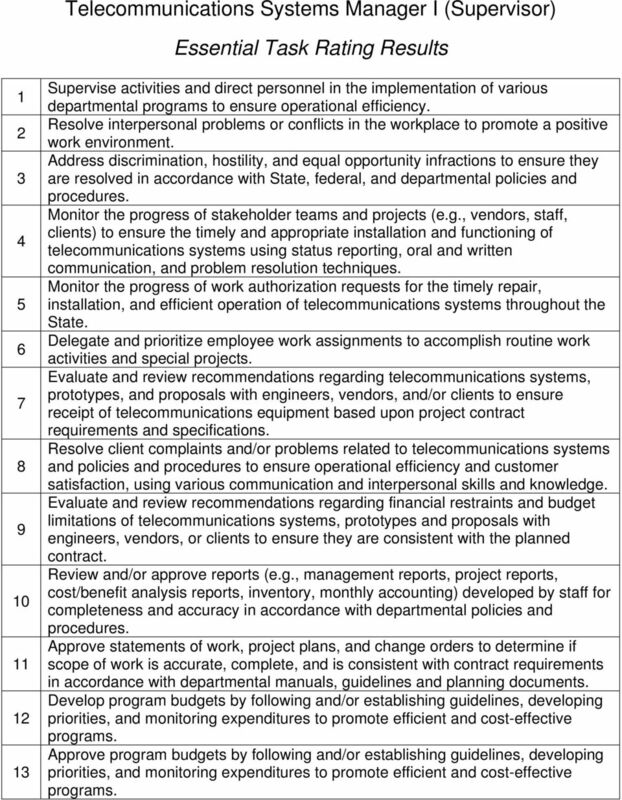 Review and evaluate the work of vendors and/or internal staff (e.g., fiscal, engineer) to ensure effectiveness, technical adequacy, and compatibility in the resolution of telecommunications service problems. Monitor the installation of new telecommunications systems, equipment, and services based on operational needs using project management methods and tools, input from management, stakeholders, and vendors to ensure adherence to action plans and/or schedules. Approve unit s operational need requests and provide recommendations regarding acquisition of material, equipment, and safety items. Complete employee performance evaluations and probationary reports to ensure performance is critiqued, goals are outlined, and personnel are informed on job performance and behaviors and to maintain acceptable standards. 3 Review equipment specifications to acquire telecommunications commodities or services for clients using technical knowledge, stakeholder input, and product and vendor information. Approve equipment specifications to acquire telecommunications commodities or services for clients using technical knowledge, stakeholder input, and product and vendor information. Conduct employee performance evaluation meetings to ensure performance is critiqued, goals are outlined, and personnel are informed on job performance and behaviors to maintain acceptable performance standards. Initiate and/or approve budget change proposal requests to establish new programs and/or change the funding level of existing Approve departmental purchasing forms and documents (e.g., certified purchaser, STD-65, CAL Card statement) to procure goods and services. Review and approve administrative documents (e.g., financial statements, budget reports, purchasing forms) in compliance with departmental policies and Develop documents (e.g., management reports, project reports, cost/benefit analysis reports, inventory, issue papers, feasibility study reports) in accordance with departmental policies and Mentor employees to enhance their career development, personal growth, job performance, and to maintain acceptable performance standards. Develop duty statements, hiring plans, and prepare documents to hire personnel for vacant positions. Make recommendations to client, management, and vendors to ensure operational efficiency within programs, policies, procedures, and business processes. Provide direction to others (e.g., stakeholders, vendors, staff) regarding basic equipment standards, equipment technology and advances; compliance with laws, rules, regulations, policies and warranties to ensure they are knowledgeable on equipment standards and technological options. Consult with subject matter experts to address telecommunications issues (e.g., telecommunications systems, network configurations, network architecture). Implement and monitor the progress of feasibility studies, including cost/benefit analysis on telecommunications systems to plan the installation, identify necessary equipment, and potential issues to ensure optimal system functionality. Consult with management, staff, clients, agencies, professional organizations, and vendors to provide technical information using departmental policies and procedures, state and federal telecommunications regulations, Government Codes, Public Utilities Commission guidelines, and the State Administrative Manual. Approve telecommunications systems performance reports (e.g., call statistics, radio coverage, traffic, user base) to analyze and solve telecommunications systems performance issues. Develop and/or revise operational requirements and procedures to ensure optimal telecommunications systems program functionality. 4 Prepare administrative documents (e.g., financial statements, budget reports, purchasing forms) in compliance with departmental policies and Provide recommendations on telecommunications related legislation to determine impact on departmental and public entities. Review applications and resumes to assist in the employee hiring process in compliance with departmental guidelines. 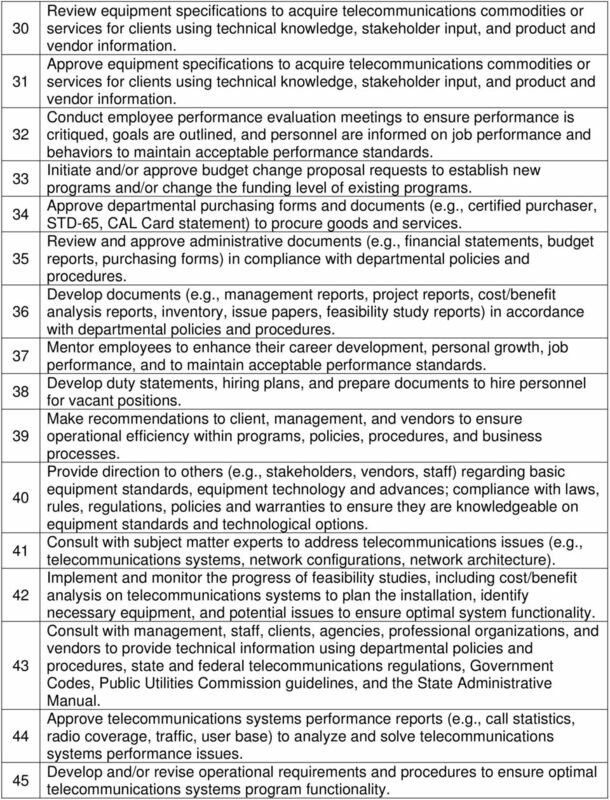 Conduct employee hiring interviews in accordance with departmental, state, and federal policies and Review and analyze manuals, policies, regulatory requirements, and proposed legislation to determine impact on unit operations, staff, departmental programs and/or policies utilizing various resources (e.g., subject matter experts, contracts, precedential decisions, legislative analyses). Review project documentation (e.g., TD-207, TD-280, TD-284, TD-290, TD-310, TD-311, TD-312, TD-400) using departmental procedures, guidelines, computer software, and technical knowledge to close out projects. Approve project documentation (e.g., TD-207, TD-280, TD-284, TD-290, TD-310, TD-311, TD-312, TD-400) using departmental procedures, guidelines, computer software, and technical knowledge to close out projects. Review departmental purchasing forms and documents (e.g., certified purchaser, STD-65, CAL Card statement) to procure goods and services. Follow-up with clients and agencies to ensure questions are addressed (e.g., billing inquires, communication site, questions regarding equipment acquisition). Review documents (e.g., TD-310, TD-400, STD-213, help ticket) using departmental procedures and guidelines, computer software and technical knowledge to initiate project work and/or the next phase of the project. 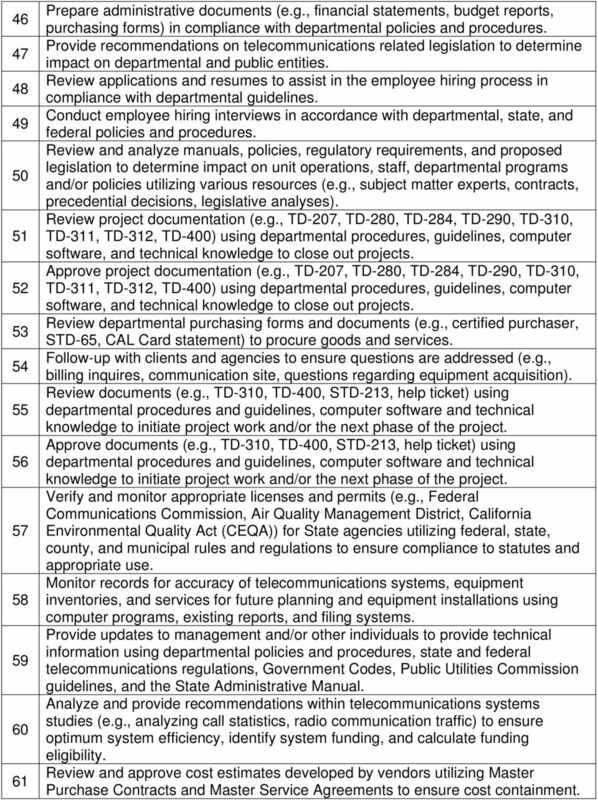 Approve documents (e.g., TD-310, TD-400, STD-213, help ticket) using departmental procedures and guidelines, computer software and technical knowledge to initiate project work and/or the next phase of the project. Verify and monitor appropriate licenses and permits (e.g., Federal Communications Commission, Air Quality Management District, California Environmental Quality Act (CEQA)) for State agencies utilizing federal, state, county, and municipal rules and regulations to ensure compliance to statutes and appropriate use. Monitor records for accuracy of telecommunications systems, equipment inventories, and services for future planning and equipment installations using computer programs, existing reports, and filing systems. Provide updates to management and/or other individuals to provide technical information using departmental policies and procedures, state and federal telecommunications regulations, Government Codes, Public Utilities Commission guidelines, and the State Administrative Manual. Analyze and provide recommendations within telecommunications systems studies (e.g., analyzing call statistics, radio communication traffic) to ensure optimum system efficiency, identify system funding, and calculate funding eligibility. Review and approve cost estimates developed by vendors utilizing Master Purchase Contracts and Master Service Agreements to ensure cost containment. 5 Serve as a subject matter expert when participating in panel interviews to assist in 62 the employee hiring process in compliance with departmental guidelines. Develop Individual Development Plans with employees to enhance their career 63 development, personal growth, job performance, and to maintain acceptable performance standards. Review and/or write correspondence to vendors, management, clients, and 64 agencies to provide information on various telecommunications issues. 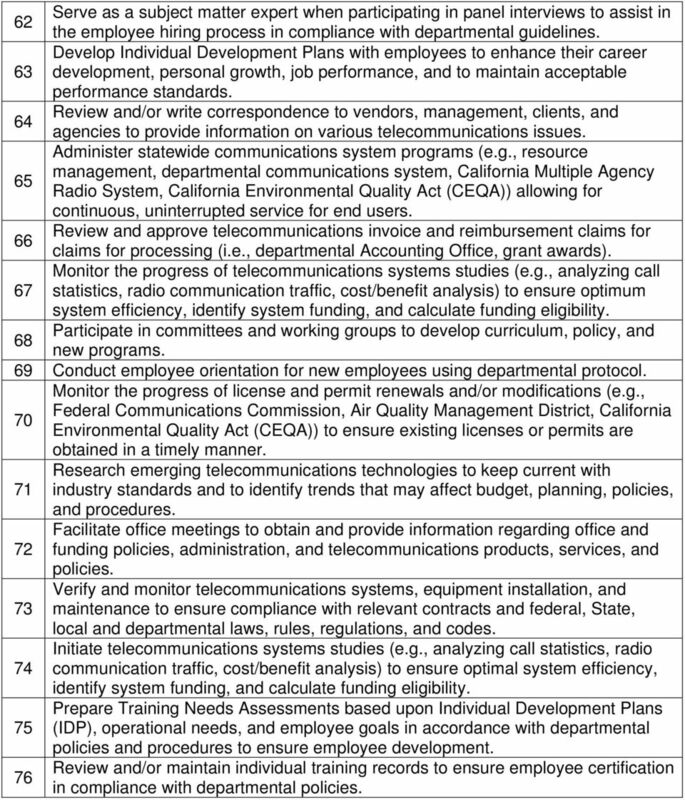 Administer statewide communications system programs (e.g., resource management, departmental communications system, California Multiple Agency 65 Radio System, California Environmental Quality Act (CEQA)) allowing for continuous, uninterrupted service for end users. Review and approve telecommunications invoice and reimbursement claims for 66 claims for processing (i.e., departmental Accounting Office, grant awards). Monitor the progress of telecommunications systems studies (e.g., analyzing call 67 statistics, radio communication traffic, cost/benefit analysis) to ensure optimum system efficiency, identify system funding, and calculate funding eligibility. Participate in committees and working groups to develop curriculum, policy, and 68 new 69 Conduct employee orientation for new employees using departmental protocol. Monitor the progress of license and permit renewals and/or modifications (e.g., Federal Communications Commission, Air Quality Management District, California 70 Environmental Quality Act (CEQA)) to ensure existing licenses or permits are obtained in a timely manner. Research emerging telecommunications technologies to keep current with 71 industry standards and to identify trends that may affect budget, planning, policies, and Facilitate office meetings to obtain and provide information regarding office and 72 funding policies, administration, and telecommunications products, services, and policies. Verify and monitor telecommunications systems, equipment installation, and 73 maintenance to ensure compliance with relevant contracts and federal, State, local and departmental laws, rules, regulations, and codes. Initiate telecommunications systems studies (e.g., analyzing call statistics, radio 74 communication traffic, cost/benefit analysis) to ensure optimal system efficiency, identify system funding, and calculate funding eligibility. Prepare Training Needs Assessments based upon Individual Development Plans 75 (IDP), operational needs, and employee goals in accordance with departmental policies and procedures to ensure employee development. Review and/or maintain individual training records to ensure employee certification 76 in compliance with departmental policies. CHAPTER 91: LANGUAGE ACCESS Sec. 91.1. Sec. 91.2. Sec. 91.3. Sec. 91.4. Sec. 91.5. Sec. 91.6. Sec. 91.7. Sec. 91.8. Sec. 91.9. Sec. 91.10. Sec. 91.11. Sec. 91.12. Sec. 91.13. Sec. 91.14. Sec. 91.15. Sec.